*Note: The above photos were taken by LifeFusion Photography. *The sign was designed by Leanne of Quaint Correspondences. 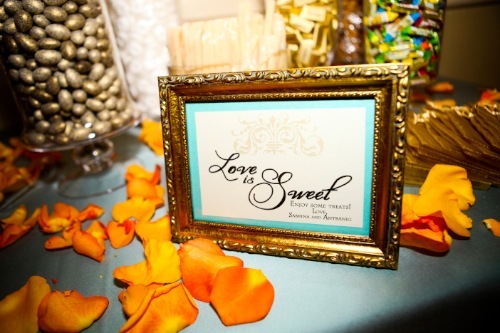 Finally a wedding post that actually relates to food!!! 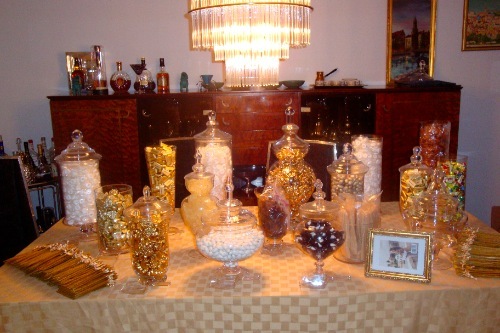 Although we had decided on no favors for the wedding I couldn’t help but do a candy buffet. They are just so pretty and it was so fun to do!!!! 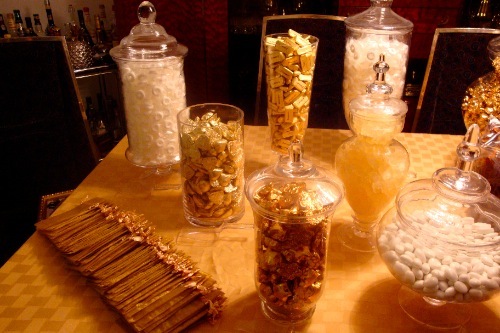 and my favorite, which is also our candy splurge: GIANDUIOTTI! We got perugina gianduiotti chocolates yum yum! They are the most delicious, melt-in-your-mouth hazelnut chocolates. amazingness. 1. First I bought the approximate amount of candy I wanted. 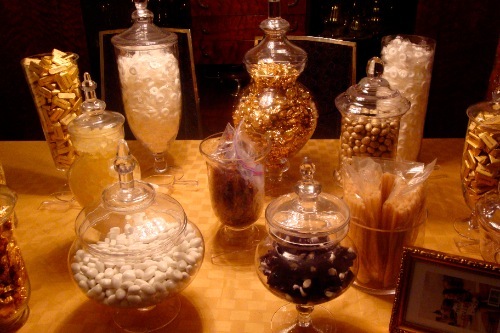 I basically thought about having a few high volume inexpensive candies (lifesavers for example) for larger vases for more height and then added in other candies that were missing (for example chocolates, something crunchy, something chewy) etc in the colors I wanted. I also bought the organza bags, which I knew I would like as I bought the same ones for my brother’s wedding. 2. Then, once the candy came in, I headed over to Home Goods and bought several vases. When I brought them home I scrubbed them with soap and water and used goo gone to help me remove the labels (thanks for the tip raz). I also bought the frame. 3. I played around with the candy and decided how I wanted it. That same weekend I went to the container store and happened to find scoops. I bought a bunch. 4. I took pictures so our venue coordinator can set it up like this for us. 5. I found the tongs online. 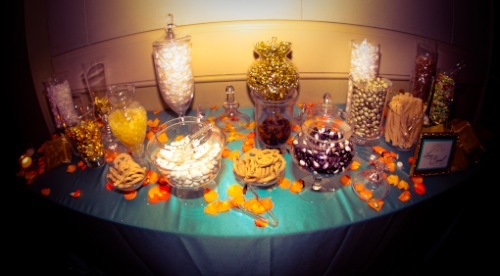 Only after setting up the whole buffet did I realize I needed them! Can’t scoop gummies! And then today I did a bunch of misc. errands, wrapped PB’s wedding presents, and numbered all of the boxes that need to be delivered. As soon as I hit publish I am going to type up that list with details and email it off to our day of coordinator, Lisa, who is already rocking my socks off. That looks awesome! So exciting! I still need to finalize my seating chart. Beautiful display! I am planning the same for my wedding. They are not as popular around here, so I hope my guests pick up the concept! Looks great! Where do you get goo gone? I need to use that on my jars! Hey girlie! The shrimpies are from a local seafood store (pulled right out of the bay close to our house). I’d recommend trying a local shop – they taste so much better! what a great idea- it looks gorgeous too! Great idea! It looks so pretty! 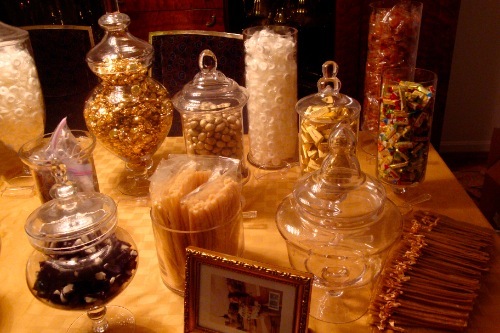 So funny…I am doing a candy buffet too!! I’m also pretty sure thats going to be our favor, because I am having a hard time coming up with one! LOVE your set up! Thanks for posting where you got all the candy too!! If you don’t mind my asking, about how much did this whole thing cost you? I was thinking about doing a cookie bar and having close friends bake items for it, but now I’m thinking that’s a lot to ask people to bake like 150 cookies (plus the cost of ingredients add up!). But all we have for dessert is cupcakes (no cake) so I kinda want to do something else…but something low effort and low cost, LOL. Does that even exist? ?